TALLAHASSEE, Fl. (WTXL) - The Leon High School volleyball team has long been a force to be reckoned with. The Class of 2019 has been stellar, reaching the Final Four all four years, and in 2017 they finished State Runner-up. One of those seniors, Kate Powell, committed to play college volleyball on Wednesday. 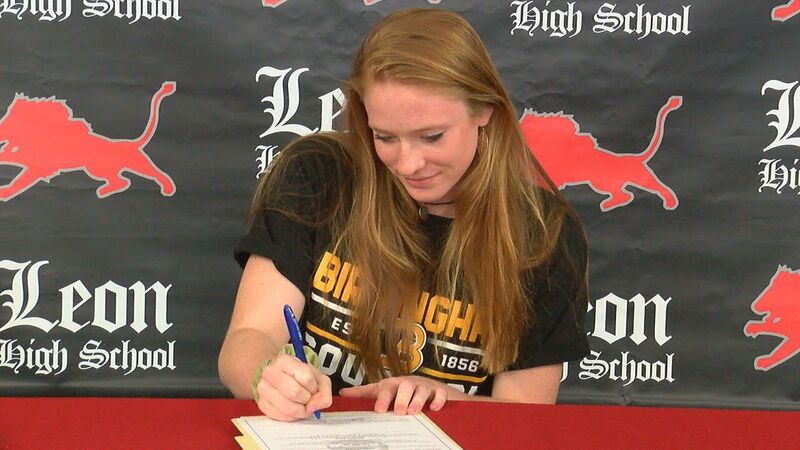 Birmingham-Southern the destination, a school she'd been looking at since her sophomore season, and when it came down to it, becoming a Panther was an easy decision. "It was kind of down between two schools and I was just thinking about it, and I was like, I've been visiting this college and wanting to go there since my sophomore year," she reflected. "I know this is the place for me and I just decided to do it. Actually signing and there's nothing I can do now, which is perfect. I'm so excited to go there. It just feels like I'm kind of beginning the next step of my life right now which is amazing!" Powell said she'd like to attend law school one day, and eventually get into politics.